Who’s been bugging your patients? Could that fever be due to parasitic pathogen? Is there a blue dot on the SNAP? Join us for a FREE 2-hour VETgirl online veterinary CE webinar, thanks to sponsorship from Elanco Animal Health, where Dr. Leah Cohn, DACVIM, PhD, reviews tick-transmitted pathogens of dogs and cats. Dr. Cohn will review when, where, and how pathogens are transmitted from ticks; dilemmas associated with recognition and treatment of these pathogens; and the pros and cons of screening tests for tick-transmitted pathogens in healthy pets. Are these only LIVE webinars or are they archived afterwards?? All VETgirl webinars (although given live) are recorded, archived, and placed in the VETgirl library to view OR review at any time for our ELITE members. Not that we know of – you can try Idexx’s website? …but you want to watch this webinar and get CE credit? • VETgirl webinars are not designed nor meant to be viewed in a group setting due to RACE-CE audit purposes. Inappropriate sharing or viewing of the webinar may result in revoking of membership. 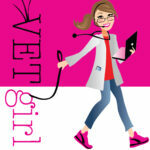 • Viewing VETgirl webinars as a recording is only available for VETgirl ELITE members.